Trailers – @ 1st Impression? There are times when it becomes unmistakably apparent why I love my job so much. Writing is certainly not for those who wish to make a quick buck, or for those exuberant Type A personalities who need excitement at every turn. Writing is also meant to be a solitary art, even if those weird-looking guys at Starbucks typing away on their computers (all the while trying to chat up the cute girls at the adjacent table) may argue to the contrary. But once in a while, something will cross my path that simply makes me joyous to the depth of my soul and I feel proud to be able to write about it and spread the word. Watching a preview of Gianni Di Gregorio’s directorial debut ‘Mid-August Lunch’ this past Tuesday was one of those magical moments when I knew deep in my heart I was getting privileged advance access to a gem, a little-known secret that would now rest carefully in my hands, ready to be shouted -- or written up, in this case -- from the rooftops. Don’t get me wrong, this is not a film for everyone. In an age of bigger than life, in your face, beyond plausible belief extravaganzas like ‘Avatar’, Di Gregorio’s film is an anomaly, a slice-of-life, quiet moment in the lives of five wonderfully interesting personalities, who share a simple meal together and bring joy to their audience in doing so. If you expect something momentous to happen, you’ll be disappointed. But if you go into the theater expecting to feel, to experience and to think about the characters and their emotions for a long time to come, then you are ready to watch one of the best films of the year. OK, so it’s a given that I am a proud Italian, that I spent many summers in Rome -- where ‘Mid-August Lunch’ takes place -- while I was growing up and these facts might make Di Gregorio’s film hit closer to home for me than for someone who may have grown up in suburban Chicago. In fact, I found myself tearing up within the first five minutes of the movie, when Gianni reads a ‘bedtime story’ to his Mom and they end up discussing D’Artagnan’s probable eye-appeal. But having a similar background as the characters in the story is not a prerequisite for the enjoyment of ‘Mid-August Lunch’. Everyone with a basic connection to their emotional experience can derive great pleasure from this charming insight into the lives of those that come from an Italian era now past, when living above one’s means was a possibility and surviving on charm a given. 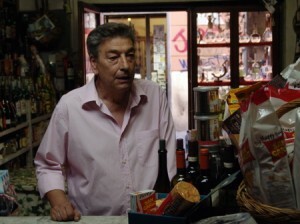 Perhaps the great bond one feels with the slice-of-life, very personal story of ‘Mid-August Lunch’ has to do with Gianni Di Gregorio’s well-respected screenwriting career. 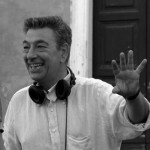 He co-penned the script for the cinematic portrayal of the Neapolitan Camorra mafia in the screen version of ‘Gomorrah’ - the book which cost writer Roberto Saviano his virtual freedom. 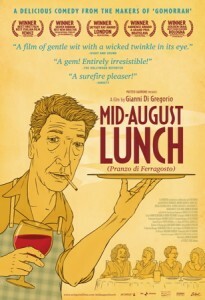 In fact, the director of ‘Gomorrah’ Matteo Garrone produced ‘Mid-August Lunch’. And Zeitgeist Films is distributing it here in the US… Somehow, everything they touch these days turns cinematic gold! 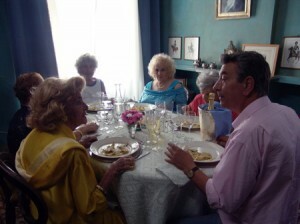 Indeed, one cannot write about ‘Mid-August Lunch’ and not mention at length the four phenomenal women in the film. All first-time actresses, they are natural, feisty, fabulous and… no spring chickens! In fact, they are as far as they make them in looks and spirit from any typical leading lady seen before, yet have enough wit and charisma to outshine any Hollywood starlet of the moment. Gianni’s mother is played with aristocratic ease by Valeria De Franciscis, Marina Cacciotti is flirtatious and unpredictably fabulous as Luigi’s mom, Aunt Maria is played with deadpan humor and bouts of elderly repetition by Maria Calì and Grazia Cesarini Sforza plays Grazia, the doctor’s mom, with a great appetite for life and friendship that are truly infectious. In fact, the whole film put me in the mood for some ‘Pasta al Forno’ and some Grey Mullet with potatoes. As well as the urge to call my aunt in Rome… Watch it to know why. ‘Mid-August Lunch’ will be at Film Forum in NYC for two weeks, starting March 17th and then in LA at the Laemmle Sunset 5. But if you don’t live in NYC or LA, it will also definitely hit a theater near you. For complete details check out their website and click on ‘WHERE TO SEE THE FILM’. This entry was posted on Saturday, March 13th, 2010 at 12:55 pm and is filed under Film Reviews, Films 2 See.